What is a Custom Classic? 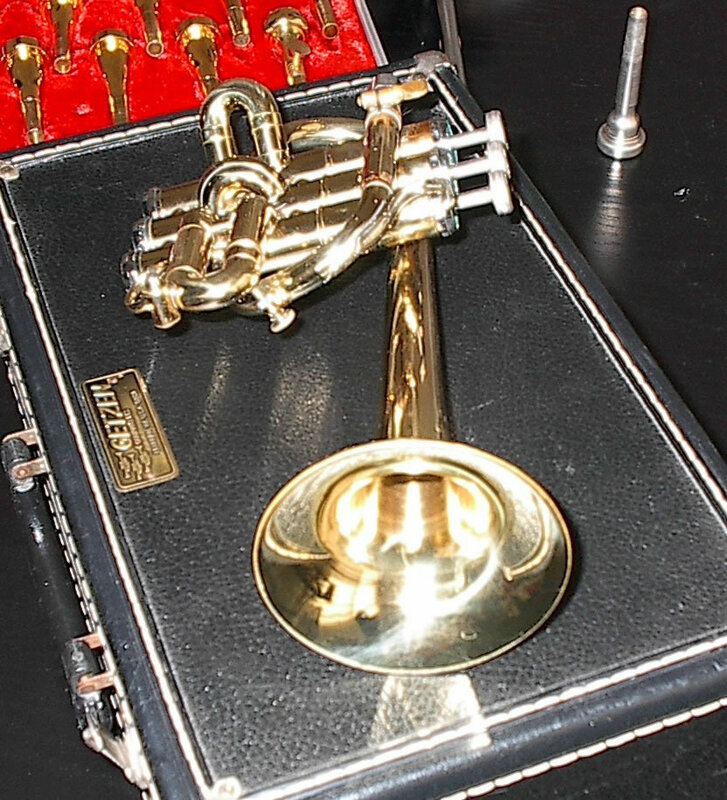 Would a hybrid trumpet be right for you? Why buy a custom built? Why spend on Vintage classic/mod & not a new trumpet? How green is your production facility? HORNS for SALE: eMail me at trumpetgirl@classictrumpet.com for more info. Please email with offers & questions. BENGE TRUMPETS FOR SALE NOW!!! Early Los Angeles, ALL new pistons from Zig Kanstul in Anaheim in 2008. Below find a list of my most often in stock trumpet and cornets. Email me at trumpetgirl@classictrumpet.com for more info. I want a pro horn & can't afford it. A custom Classic is a vintage, quality horn modified and rebuilt, with custom improvements which bring it into the 21st century, and raise it to a professional horn standard. 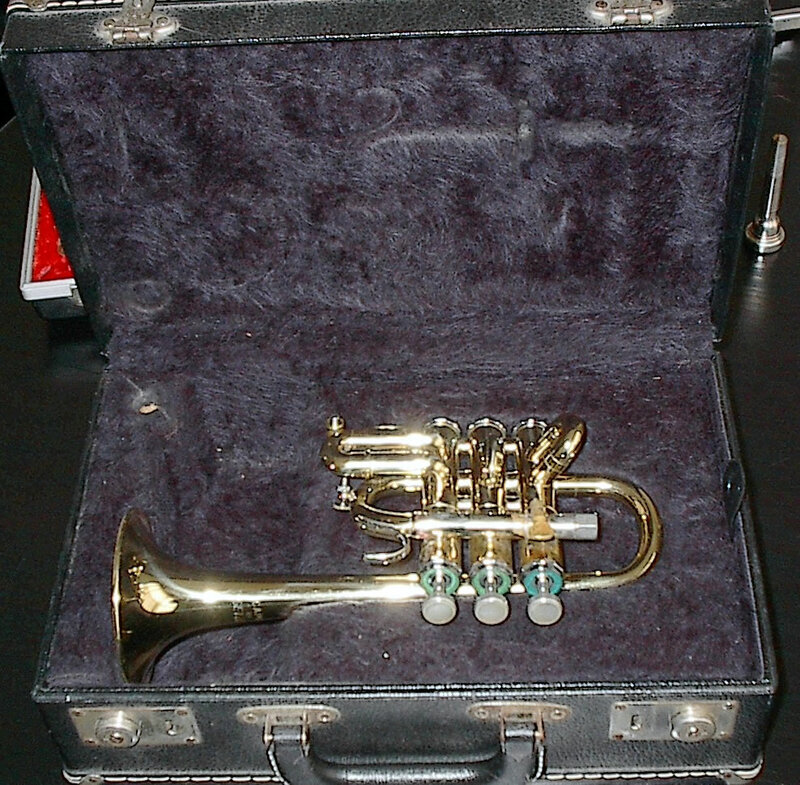 A vintage or student horn can have all the features of a pro model - be just as easy to play, for a much lower price. A custom leadpipe, first & third slide reversals/rings and bracing conversions can make an old favorite into a new comeback player that you just can't put down! Precision adjustment for the stock mouthpiece-receiver-leadpipe gap for your chosen mouthpiece can make a difference for anyone. 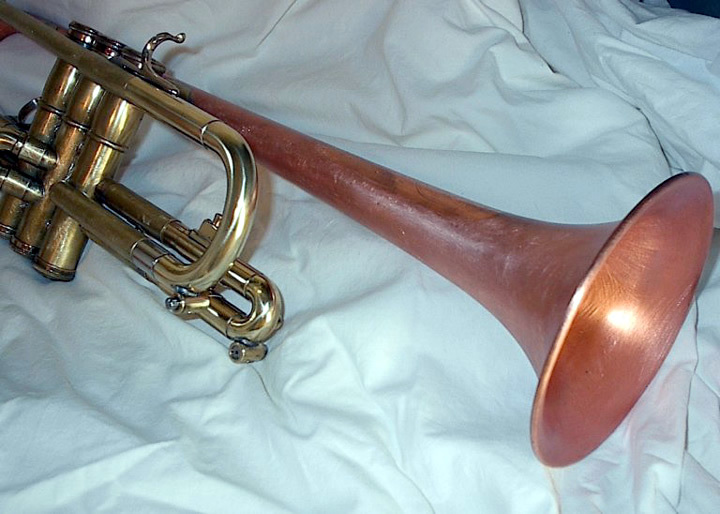 The most affordable / playable horn is a custom classic. 1930s-40s Hybrid trumpets were built by York, Acme, Grand Rapids, Rudy Muck & others. No one makes a trumpet with the sound I want! So, how do I choose? My Bb & C trumpets play so differently, what can I do? Don’t chose! 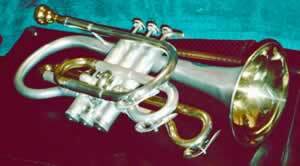 By using Bb parts to build a C conversion, your C trumpet will feel very close to the Bb version. My well-loved horn is just worn out – Put that antique bell onto a more recent body and keep playing the vintage sound, but with modern intonation and new parts! I prefer most the valve action of my OLDS, but the sound of a copper or nickel bell is for me – Not a problem to change it to your specs. My Yamaha or Schilke valves are the Yamalloys but the overall sound is good – Put that bell & slides onto a better valve assembly unit! I want a more decorative bell design - mixed metals, custom bend. Find your favorite bell design and put it onto a great playing body! Customized bells are not a problem to install. My old large bore trumpet sounds so stuffy! old 485 bore Conn Pan Am, Director / 470-4 bore German built stencils - Install a new leadpipe with a modern taper, it will improve playability immensely! Why not try a hybrid now? Performing is always a special occasion … Make it easy! Most recently, parts design & brand names have been interchanged between models. That blurs lines of quality & expectation…did you know that the newest Conn Vintage One and Benge 90 models are actually on a King valveset? And, now the King Silver Flair is not a King at all! Players, including comeback players, who are shopping for a vintage horn by brand or model name will be left disappointed. No longer are student horns made with hand fitted quality, or at a good price. If you want an inexpensive, new student trumpet? Bach does market one, it comes from China now, but with their American name on it. It is not US quality! Many players buy the so-called professional horns only to have them corrected & modified to play properly by someone else, who is more sensitive to a player's needs. The Bach Stradivarius is a prime example. Professors teach to the horn - not the player. These factory, built-in defects consume time to overcome. That time could be spent developing/perfecting your style. Why have these issues at all? 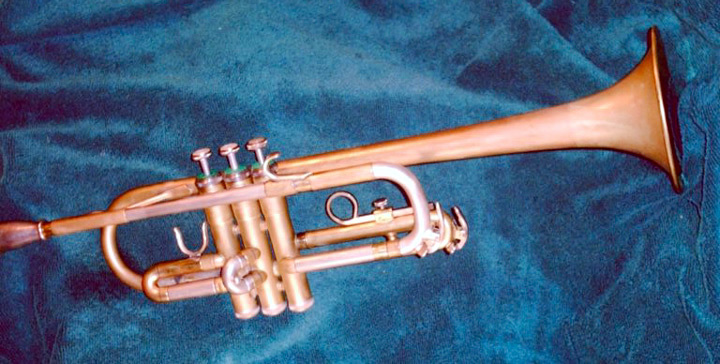 A Strad bell mounted onto your favorite trumpet body gives the same sound, without added playing hassles. “I want a horn with lasting 'sizzle”. It’s hard to play for long hours on my Schilke or CG Benge because they are so light in weight that, most of the air energy is gone before it exits the bell flare! The use of a heavier, larger bore body (with a lightweight bell or shaved flare) helps with most endurance problems and keeps the sizzle going! I think I am playing loudly, but still cannot be heard. Projection is your problem. Adding some weight to the bell/leadpipe braces or valveset greatly improves the projection & volume, so you work less & sound better! Many articulation problems are largely due to the mouthpiece-to-receiver-to-taper gap. This is a minor problem and makes players go on an equipment safari & waste their money! I adjust a given horn to sound its best, fitted to the mouthpiece of your choice. It is play tested until I am satisfied! A reversed leadpipe & slides will always improve airflow & pitch quality –These are solid facts! A custom trumpet is built for you the player, for ease of playing, not for any high profit margin! Why spend on vintage or classic & not buy new? Why not? American horns built between 1940 & 1970 are of the best quality ever made! The phrase ‘Buy American’ meant something when there was still real competition & pride in the manufacture of instruments. Student horns of yesteryear are of much better quality than new pro horns offered today, which is why I use them often to build upon. If you need an affordable horn, but with quality/durability to learn on, Think about a refurbished American Classic trumpet or cornet. 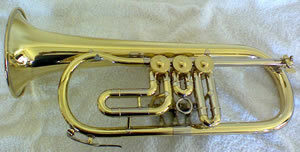 For example: Conn Director, Holton Collegiate, Getzen 300 series, Selmer-Bundy, Olds Ambassador. All are very well made instruments. 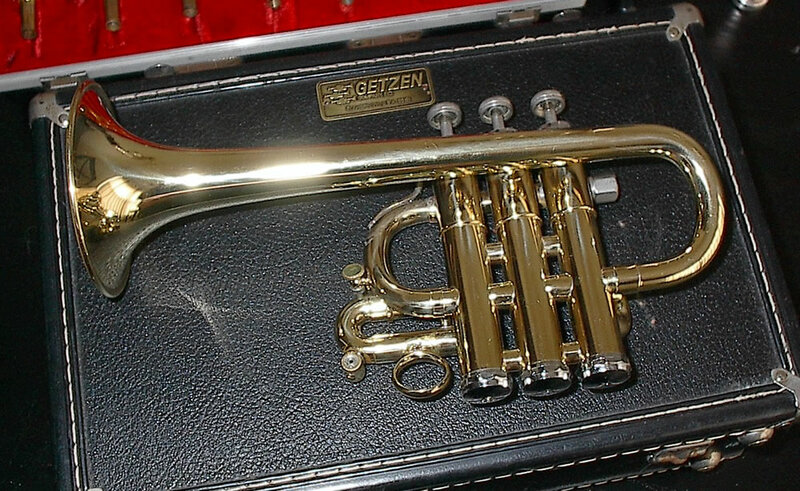 Classic trumpets were built for the time's most popular players and many had custom features. In the sales arena, a player's great sound was often attributed to their choice of trumpet. 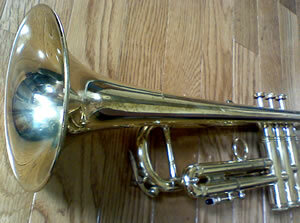 Old timers like, Freddie Hubbard, Lee Morgan, Louis Prima, and Roy Hargrove all played on the (student) OLDS Ambassador! Bix Beiderbecke's and Wild Bill Davison's original 30s jazz sound came from their Conn Victor 80A (cornets). Generations of players have pursued the sound quality of: Miles Davis' or Chet Baker's Martin Committee, Dizzy's Silver Flair, Harry James' & Satchmo's French Selmers. Doc Severinsen endorsed Getzen, Conn & BelCanto. 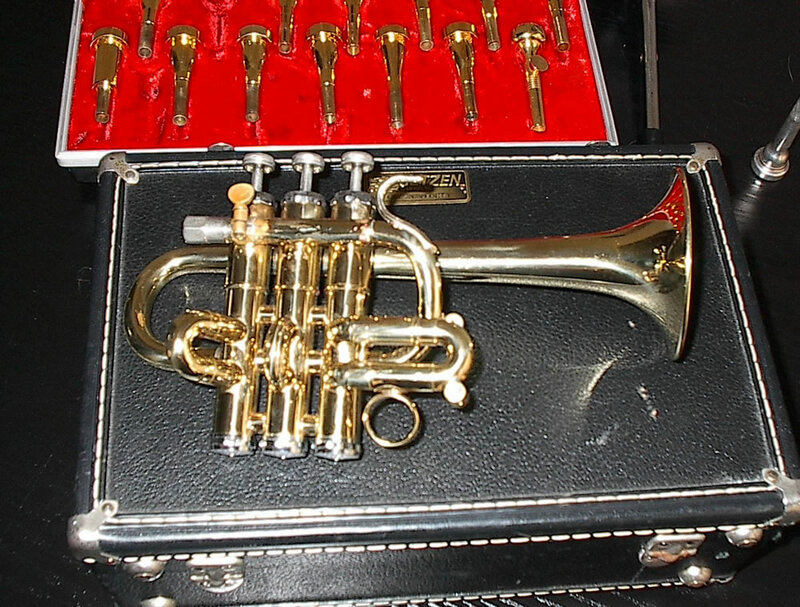 A vintage or classic trumpet will always retain & increase in value - they don't make them like that anymore! Current (unionized) assemblers keep up their production numbers now, and the price is a sacrifice of quality. Many companies achieving large production output often sell some of their horns without labeling them, so a dealer or store can ‘stencil’ their own name to it. Early on, many small US companies were importing & relabeling inexpensive Austrian, Belgian, or West German made horns (Baxter-Northrup, JW Pepper, York, Lyon-Healy, etc). Europe was our 1950's "China" for cheap horns! Larger American builders always stood behind the quality of their parts, assembled or not.... Perhaps the largest builder of stencil trumpets was Blessing. Commanding a wide & early market with their high quality valve sections, they were able to sell everything they could make, often taking up the shortfalls of their competition's shipping commitments! The first New York Bach trumpets were made with Blessing valves. I have Blessing stencils that were built for DEG, Donald E. Getzen (in .464 bore), and Conn’s Pan-American model, Commander by Gretsch (468). At the stores, - Rockwell-Nappe, Silvertone at Sears were big private stencil labels. Stencils from Getzen - Boston Beacon & many others, are found, notable by the early "deluxe" model type distinctive two piece bell (may be joined by the heavy, single piece brace (which is the hex mouthpiece receiver) & the simple pressed/hammered brackets elsewhere. These were very well made horns! Blessing is still an independent company in Elkhart. And Getzen still exists in Elkhorn. Both of these companies, I consider truly ALL AMERICAN, since they both still build & market their own line of student instruments, as well an excellent professional line of instruments. It was easier for Sears to change builders than rename ‘their’ horns or reprint catalogs. Buying a stenciled instrument is a sometimes-cautious venture, but it can be rewarding! The best of low- & non-toxic materials / processes available. I often find ‘take-off’ parts removed from newer horns by high end builders, like Harrelson. All cleaning, soldering, polishing operations used are non-toxic to me, the player & our environment. Elbow grease is a rarely known commodity today & I use it often! I am a very safe builder, with a dangerous horn, offering a great and unique playing experience. Try a Custom Classic today! Lead Trumpet Girl eBay page  find more items for sale here. 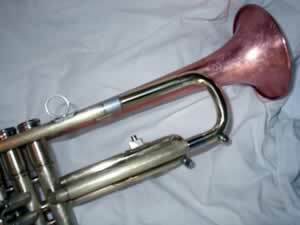 http://www.quality-brass.com/  web-based brass dealer: vintage trumpets, cornets, and other instruments. http://rudymuck.info/  the site for Rudy Mück information. http://www.trumpetherald.com/  the largest and oldest community site for trumpet players on the internet. http://www.trumpetmaster.com/  the premier trumpet site on the web. http://trumpetland.ning.com/  trumpet photos, videos, sound clips & blogs. 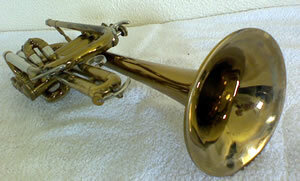 http://www.horn-u-copia.net/catalog.php - The best vintage brass instrument reference catalog on the net.